The number of planets around the Sun could rise from nine to 12 - with more on the way - if experts approve a radical new vision of our Solar System. An endorsement by astronomers meeting in Prague would require school and university textbooks to be rewritten. The proposal recognises eight classical planets, three planets belonging to a new category called "plutons" and the largest asteroid Ceres. Pluto remains a planet, but becomes the basis for the new pluton category. The plan has been drawn up by the International Astronomical Union (IAU) with the aim of settling the question of what does and does not count as a planet. Some 2,500 astronomers gathered at the IAU General Assembly in Prague will vote on the plan next Thursday. "For the first time in more than 75 years, we will be able to discover new planets in our Solar System. This is a fascinating prospect," said Richard Binzel, a member of the IAU planet definition committee which put together the proposal. But the solution was not popular with all experts. Robin Catchpole, from the Institute of Astronomy, Cambridge, told the BBC: "The public are very clear about what they understand by 'planets'. Those are the big, dominant bodies in the Solar System that we're all familiar with, the eight - or nine if you include Pluto. "I think including more is going to add confusion to the public, but not really be particularly useful for astronomers." Experts have been divided over whether Pluto - further away and considerably smaller than the eight other planets in our Solar System - deserves the title. Since the early 1990s, astronomers have found several other objects of comparable size to Pluto in an outer region of the Solar System called the Kuiper Belt. Some astronomers believe Pluto belongs with this population of small, icy "Trans-Neptunians", not with the objects we call planets. Allowances could once be made for Pluto on account of its size. At just 2,360km (1,467 miles) across, Pluto is significantly smaller than the other planets. 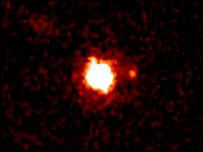 But until recently, it was still the biggest known object in the Kuiper Belt. That changed with the discovery of 2003 UB313 by Professor Mike Brown and colleagues at the California Institute of Technology (Caltech). After being measured with the Hubble Space Telescope, it was shown to be some 3,000km (1,864 miles) in diameter, making it larger than the ninth planet. The IAU draft resolution recognises eight "classical" planets - Mercury, Venus, Earth, Mars, Jupiter, Saturn, Uranus and Neptune - three "plutons" - Pluto, Charon and UB313 - and the asteroid Ceres. Charon is currently described as a moon of Pluto, but because of its size some experts consider it a twin planet. Professor Owen Gingerich, who chairs the IAU planet definition committee, said: "In a sense we're demoting Pluto by taking it off the list of classical planets. But we're promoting it by making it the prototype of this new category of plutons." Dr Andrew Coates of the Mullard Space Science Laboratory in Dorking said: "Something had to be done about the definition. It does change the textbooks somewhat, but it also demonstrates that this is a vibrant area of research. "The surprise is Ceres, because most people thought of it as an asteroid." 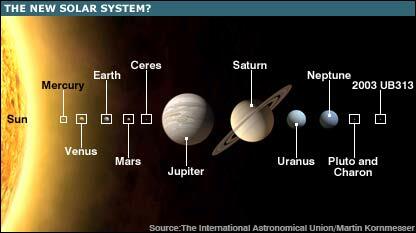 Ceres is the largest object in the asteroid belt between Mars and Jupiter, and like a planet is spherical in shape. "This a step backward," said Alan Boss, an astrophysicist at the Carnegie Institution in Washington DC. "It's a demotion of the word planet." The Carnegie researcher, who believes there are only eight true planets, said the term would lose its prestige under the proposed definition because anything round of a certain size could join the club. "Folks aren't going to have to worry about learning the planets anymore because it's a list that doesn't mean anything," he said. The basis for this re-evaluation is a new scientific definition of a planet which uses gravity as the determining factor. On whether he was confident the resolution would be passed, Professor Gingerich told the BBC News website: "It will be a very awkward situation if they don't. "On Sunday afternoon, we proposed it out of the blue for the division chairmen and they voted unanimously that they would be prepared to back it. That's a good cross-section of astronomers. "I'm sure it will be controversial to those with a stake in some other solution, but I hope we will get an overwhelming endorsement." More objects are likely to be announced as planets in the future. The IAU has a "watchlist" of at least a dozen other potential candidates that could become planets once more is known about their sizes and orbits. These include the distant objects Sedna, Orcus, Quaoar and 2003 EL61 and the asteroids Vesta, Pallas and Hygiea. The IAU spent two years debating the matter among its membership. A seven-member committee was set up to consider the findings and produce a draft proposal. The body has been responsible for the naming of planets and moons since 1919.